The Zen of Grand Mothering is another way of saying to be in the moment with your grandchild. We all have busy lives that demand all of us to go in different directions at all times. The word Zen has many different definitions. To be in the present moment is one definition. The whole point of Zen practice is to become fully aware, here and now.When We get the opportunity to spend time with our Grandchildren ,and all of our love ones, to be fully present both mentally and physically is essential to building a bond.With a child they tend to demand our undivided attention when in their presence.Often times we are interacting with our Grandchild at the same time as attempting to engage in other activities; Visiting with others, household chores and other activities. To set aside an hour , 1/2 a day or a weekend is very important. To practice the art of mindfulness with a child is essential. When we take time to sit and cuddle, hug, hold their hand and bond with them this is a Zen moment. Reading, singing,laughing are all ways to be in the moment.When your Grandchild is a teen often time they are not interested in spending time with you. What can help during this time is planning a physical activity away from distractions like television, I Phones and shopping.Take a walk near the ocean,find a park to explore,gardening and crafting are all good one on one activities when spending time with a teen. We think of teens as aloof and distracted when really they are wanting some Zen moments too.I hope this helps remind all of us to be present both physically and mentally with our loved ones.I know I need to practice this more often myself. How are ways to spend Zen moments with your Grandchildren or loved ones? 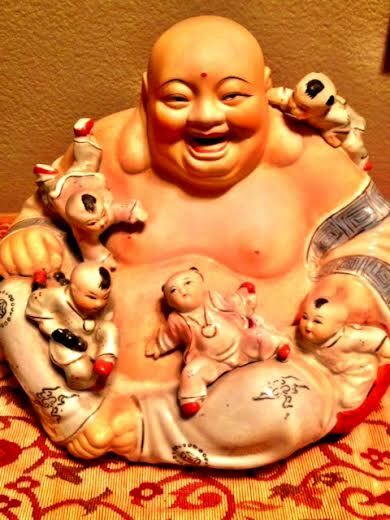 This Budda was a gift from my Mom ,Fifi, when Michael and I were married. Her intentions were to inspire some off spring of our own. While this was not in the cards for us I like to think this Budda is a sign of Grandchildren to come. Teaching and playing games is one of my favorite activities to share with our grandkids. For example, Mancala is a sure bet winner. I’ve taught the four oldest ones to play and now Emma, our four year old granddaughter makes a beeline for Mancala when she walks in the door. Not that she knows the rules yet…or rather has her own, she associates it with coming to our house. Two other favorites are dominoes and Old Maid. It’s just so much fun to play simple games together, esp. ones that are uncomplicated and everyone has an equal chance of winning. Aside from reading, which is another gift I love to share with our grandkids, games are just the perfect way to spend time together. A few years ago we were lucky enough to spend a long Christmas weekend with all of the kids and grandkids together. My one request was that we spend one entire evening unplugged and suggested we all play board games. It was so much fun we did it all three nights we were together. This past summer we got together again and this time, the grandkids brought the games and we all had a blast. So, that’s our zen time…game on.